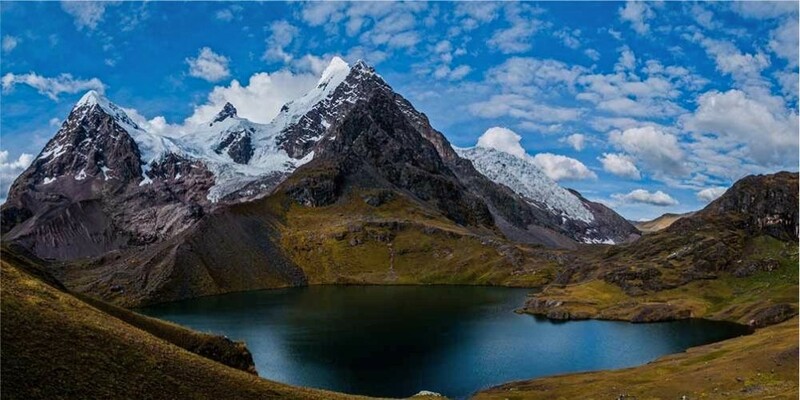 Hiking completely around this mystical mountain, you will camp near hot springs and turquoise lakes inhabited by numerous bird species, including Andean goose and the almighty Andean condor. As you trek, you will walk amongst herds of llamas and alpacas in remote native Quechua villages. Your guide will meet you in Cusco 6am in the morning, and take you via private transportation to the starting point of our trek at Tinqui where we load up your gear onto the packhorses. We will hike for the next 3 hours or so and then you will enjoy a local lunch, after lunch you will continue hiking to our first camp. This day we only hike for a few hours until we arrive at the village of Upis. Here you will have the opportunity to take a soak in the hot springs, while enjoying coca tea, and relaxing your muscles until dinner. With two passes to cross today, we wake up early at 5am with coca tea brought to your tent and you will fuel up with a big breakfast for the day ahead. The morning starts with a hike up Arapa pass (4,958m/16266ft) before we descend a bit to our lunch spot near Lake Puma Cocha– a deep blue lake and a perfect stop for a break. Along the way, you will see local herders and llamas, Ausangate Mountain to your left, and you will have your expert guide explaining the history of the locals and talking about the landscape along the way. After lunch, we continue uphill for our second pass, Pucacocha (5000m/16404ft) where if you are lucky you may see condors and vicuñas. We descend to our campsite of Chillca where you will be surrounded by high mountains and incredible hanging glaciers, where you can watch for the glacier crashing into the lake below! As always, camp will be set up for you to change and rest your weary legs while dinner is being prepared. Today starts with Chillca pass (5051m/16571ft), a very colorful mountain but only a precursor of what is to come. After crossing the pass you enter into the Red Mountain valley, a wildly desert landscape with vibrant colors all around, and llamas roaming the ground below. When you approach the top of the pass, you will see the beautiful Rainbow Mountain in the distance, but you are not quite there! From here, you descend to circle lake and continue walking a Peruvian flat until we are presented with one final climb to the Rainbow Mountain. Soak in the sights and enjoy what you have worked so hard to reach. We will enjoy lunch in the surrounding area, and head back down the valley to make our way to the stunning Lake Ausangate where camp will be set up and waiting for you to take a rest. Covering less kilometers today, as yesterday was a big day, we pass beautiful glacial tarns, lush green pampas, and follow the edge of the river. Today is a great day for spotting wildlife so keep an eye out for condors, and vicuñas. With only one pass to cross today, we will take our time today enjoying the deep blue lagoons, and alpine glacial colored lakes along the way. If you are brave enough you can even jump in to cool off or take a swim. Views of the massive Ausangate Mountain are still visible, only today you will get to enjoy them from a new angle along with views of Pacchanta Valley. Our goal is the hot springs of Pacchanta where we will enjoy a nice soak and the views of the Ausangate Mountain above. Today is the easiest day of our trek as we make our way back to the starting point of Tinqui, walking on flat ground and celebrating our accomplishments. Once we arrive at the village you will have your last lunch while everything is packed up in our private transportation to make our way back to Cusco where. You will be dropped off at your hotel arriving around 5pm. 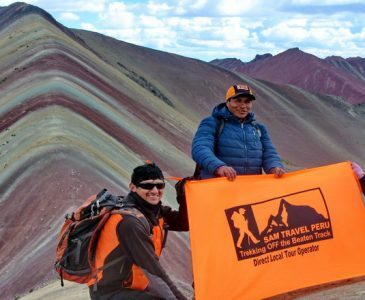 The Ausangate Rainbow Mountain Trek is available to depart any day of the week as long as we have two people. ***This price includes the extra porter who will carry your belongings up to 7kgs, we provide you a duffle bag, to put your things. Group of 5 or more:$30 USD. – All you need is to book the trek together at the same time. Hot water bottles to put into your sleeping bag so you can sleep like a baby. In an effort to provide a more personalised service to our passengers, we, in SAM Travel Peru have a policy that our groups will not exceed 8 people. This sets us apart from other companies that operate departures with bigger groups. I am very proud of my guides! 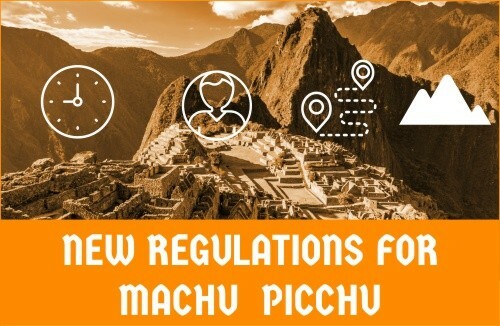 Highly professional, speaking fluent English, very knowledgeable, passionate for the Inca heritage/ history, dedicated to a steady personal development, learning to ensure that you receive accurate and recognised theories about the Inca Andean culture. Fun loving, great sportsmen and well educated crew as well as having a degree in Archaeology, Botany, History or Anthropology. Some of them are great entertainers and the best “Salsa Dancers” on this side of Machu Picchu. 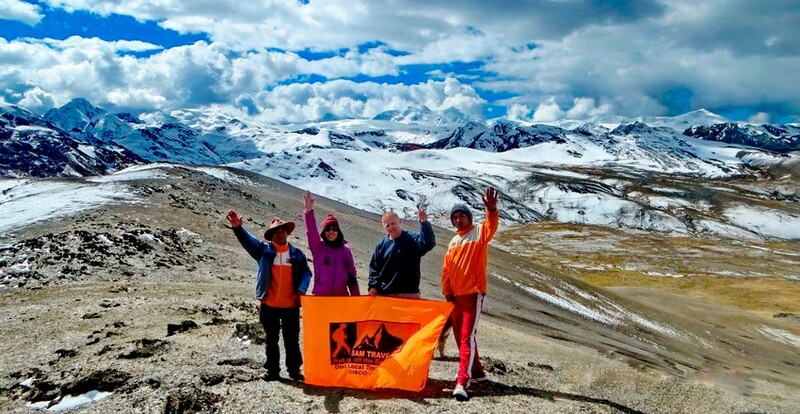 Hiking the Ausangate Trek with SAM Travel Peru is a life changing experience with a fully portered trek where your comfort and enjoyment are our first priority. We make sure that you get the best experience for your holiday in Peru while you interact with the locals, explore fantastic sites and re-discover remote ancient Inca towns and buildings. Having the opportunity to learn some words in Quechua and about the fascinating Inka history. Immerse yourself in the stunning landscape and simply feel the magic of Mother Nature (Pachamama) and the Andes. We carry your gear, prepare your meals, set up your tents avoid crowded campsites and take care of you while you sit back and relax. We provide the following items to our porters and cooks for free: Jacket, sun hat, warm hat, t-shirt, pants, hiking boots, comfortable duffle bags, canteen and girdle for protecting their spine, sleeping bags, mattress´s and insurance. OUR COOKS ON THE AUSANGATE TREK? Fabulous Cooks… The food on the trek has been highlighted by all our clients they say “that it was better than in the restaurant’s. “Delicious and abundant gourmet style meals, Peruvian and International Cuisine are prepared by our professional and dedicated cooks from a mixture of local and exotic produce. If you are vegetarian or have food allergies of any kind, we can cater our meal to adjust to your needs. SAM Travel Peru honours any food restrictions and special diets such a vegetarian or Vegan! OUR TENTS: Enjoy a good nights sleep in our 4 season EUREKA Timberline tents. All our tents are 4 man tents, but ONLY sleep 2, leaving lots of room to spread out comfortably and store your duffel bags. They also include a little vestibule in front, giving you some extra outdoor space to leave your boots and walking sticks so you don’t have to bring in dirt. OUR MATTS: They are used to separate and insulate you from the ground. They all are big and thick. AIR MATTRESSES: They can be rented for US$15. OUR KITCHEN & DINING TENTS: The dining tent is used as our meeting room at meal time. It´s a place to enjoy our meals and the company of fellow trekkers. OUR TABLES & CHAIRS: The interior of the dining room includes tables and chairs with two doors on each side, which are adaptable to weather conditions. MORE: Pillows, backpack, rain covers , survivor t-shirts , hot shower and the biochemical camping toilet , are provided on trek. SAM Travel Peru has always believed that we should “give back” to the communities we pass through when on our treks. Therefore, as part of our commitment to responsible tourism, we always do many social projects and hire locally. SAM Travel Peru is so proud to be able to support these beautiful people, not only employing them work but also to keep things at grassroots, to share in their homes and with their families. This makes us happy to have this holistic approach with our highland employees and their families! A beautiful reflection of our attitude in everything we do, is making life richer and more meaningful for all involved. You will be greeted at Cusco airport and taken to your hotel, please ensure that you inform us of your full flight details at least 14 days prior to trek´s start. Look out for our representative holding an orange board of SAM Travel Peru at the arrival terminal. It will take place the night before the trekking departure at 6pm at our office which is located at Calle Santa Teresa Nº383 ; 303 (second floor) we are next to SUBWAY restaurant. Of course! During the Ausangate trek your main luggage can be stored at our office or at your hotel, both are for free. 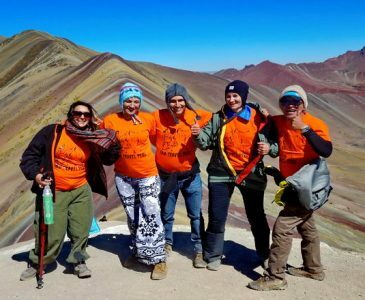 FIRST, to book your Ausangate Rainbow Mountain Trek, we need you to fill out our booking form by clicking on BOOK NOW on our homepage or click here the link BOOK NOW. 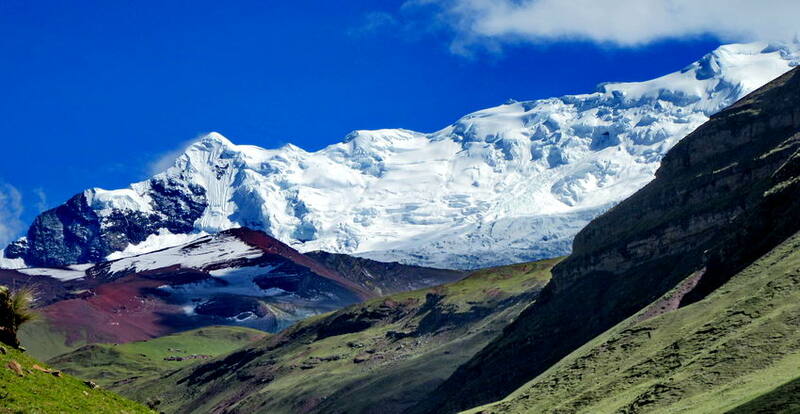 SECOND, we require a deposit of US$200.00 per person in order to purchase a permit for the Ausangate Trek. You can make you deposit by clicking on the VISA or PAYPAL symbols on the top of our home page, or you can click on the VISA or PAYPAL symbols on our booking page or click here on the payment of your choice, either VISA or PAYPAL. Unfortunately the answer is generally “No”. Once the tickets have been bought the government does not allow any changes, so we can’t change any departure dates. Tickets are not transferable nor refundable. With alternative treks we may be able to change dates for a fee depending on what has been already purchased. Please contact the office as soon as possible if you need to change your date. 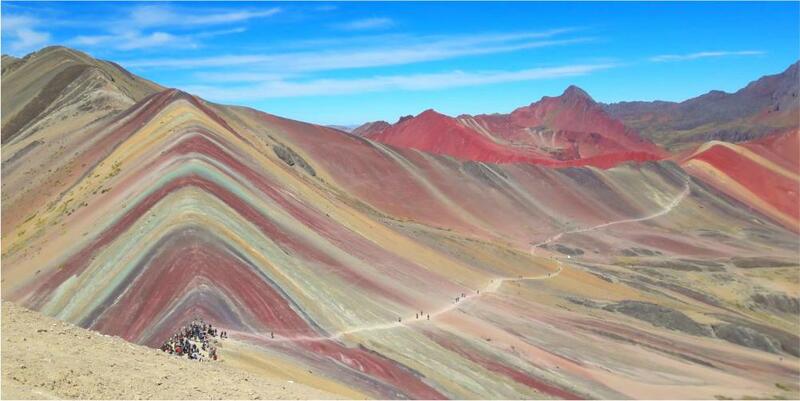 *** If you cancel your Ausangate Rainbow Mountain Trek, the deposit is not refundable at all! The weather is very unpredictable and it’s difficult to foresee. BUT you will have many different seasons as you pass through the numerous microclimates and will depend on the location. 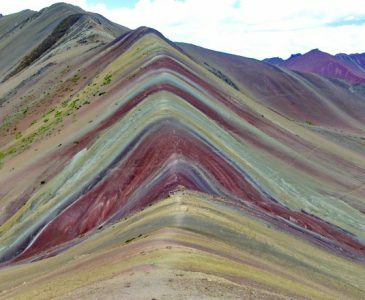 With the Ausangate Rainbow Mountain Trek, we highly recommend you bring some very warm clothes and good rain gear in your day backpack. It can be very cold at the high altitudes of this trek. In general if you exercise regularly and spend 3 days in Cusco, or in the Sacred Valley for acclimatization to the altitude, you may be just fine. The recommended medicine for altitude sickness is WATER, COCA TEA and OXYGEN IF NEEDED; our guides are trained to treat you for Altitude Sickness. For more detailed information on Altitude Sickness click this link: Altitude Sickness. We offer the Cusco City Tour and Sacred Valley tours that you can book while you are acclimatizing. Check out our day tours on our Main Page. The maximum group size is 8 persons. Usually our groups are between 2-6 persons. Sam Travel Peru specializes in SMALL, PRIVATE groups and provides a personalized service. You will have 1 cook per group. The number of porters depends of the size of the group. For a group of 2 trekkers, they will have 4 porters, 4 trekkers will have 6 porters, 6 trekkers will have 9 porters, 8 trekkers will have 12 porters. The evening before you start your trek, you will be given a SMALL DUFFLE BAG to pack your clothes for the next four days. Your weight allowance is up to 7kg/14p. Your team of porters will carry your duffle bag for you, together with the food and camping gear. It’s important to be aware, that you will not have access to your items in the duffle bag until the end of each day, as the porters will always be ahead of the group. During the Ausangate trek, you need a day backpack big enough to carry your personal belongings such as a warm jacket, a rain jacket, your camera, sunscreen, snacks, water, etc. Usually a 30 to 50 litre backpack is sufficient. Yes, it is a challenging trek with most of the you are over 4ooo meters or 13123 feet. You need to be in good physical condition and used to hiking. In preparation: try walking 15kms in a day or go to the fitness club in the months leading up to the trek. It is also important to be well acclimatised to the altitude. Try to spend at least 3 days in Cusco (3350m/11,047ft) prior to starting the trek. WHAT ABOUT TOILETS ON THE AUSANGATE TREKS? 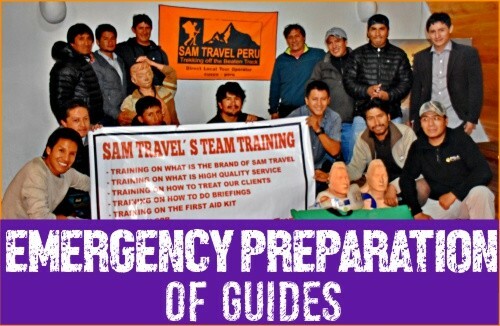 In the scenario that you are unable to finish the trek due to a health issue, Sam Travel Peru will assist you to the nearest town for help with transportation. We always carry oxygen on the trek for any respiratory problems. In extreme cases, a helicopter pick up can be arranged at your own expense. (Travel insurance required). There are no refunds in the unlikely situation that you are unable to finish the trek. ARE WE GOING TO BE DROPPED AT OUR HOTEL AFTER THE AUSANGATE TREK? Absolutely!! Included in the package and on the last day we will drop you at your hotel in Cusco! If you have booked your hotel in the Sacred Valley like Ollantaytambo or Urubamba, we will drop you there too! If you’re happy with the services provided, a tip – though not compulsory – is appropriate. While it may not be customary to you, it’s of great significance for the people who will take care of you during the trek. It inspires them to give excellent service and is an entrenched feature of the tourism industry across many SAM Travel Peru destinations. Of course you are free to tip more or less as you feel it, depending on your perception of the quality and the length of your trip. Remember, a tip is not compulsory and should only be given when you receive excellent service. Yes, we are a local, sustainable & responsible tourism operator for that we incorporate the universal principles of tourism: protect the environment and benefit the local communities by respecting their culture and religion. With this in mind, we have trained all our local staff to know and understand, respect the places and the local people. WHAT YOU HAVE TO TAKE WITH YOU FOR THE AUSANGATE TREK? WHAT TO PUT IN YOUR DUFFLE BAG IN THE AUSANGATE TREK? Sleeping bag: It has to be at least -15ºC – This can be rented from us. WHAT TO PUT IN YOUR BACKPACK IN THE AUSANGATE TREK?